Wondering, “Where can I find good-quality metal garages near me?” We have the ultimate storage solution for your vehicle, lawnmower, bicycles, or other valuable items. Alan’s Factory Outlet has a selection of metal garages with something for everyone. Our metal garage buildings protect your valuables from thieves and pests as well as harsh weather conditions, and storing your items under the shelter of a metal garage helps to keep them in good working order. At Alan’s Factory Outlet, we have dozens of quality metal carports and garages for sale, so we’re sure to have a portable metal garage that’s perfect for your needs. Our metal garage kits are available in many different sizes and styles. We have metal garages with roofs in regular (barn), boxed-eave (A-frame), and vertical-style. Our vertical A-frame roof is especially popular, as its design prevents snow from piling up by allowing it to slide down and drop off the edge of the structure. Our metal garages are custom-built in the size, layout, and color you want and come with free delivery and installation. Steel garages can be made taller with large garage doors to help protect your RV. Metal garage doors can be placed on the end or on the gutter side like in this picture. Please keep in mind that if you order metal garage kits with the garage doors on the side, the leg height needs to be 2 feet taller than the height of the garage door; when you get the garage doors on the end, the leg height only needs to be 1 foot taller than the height of the garage doors. Also, steel garages come standard with 29-gauge metal siding going horizontal, but you have the option to upgrade to vertical sides and a vertical roof as shown in the picture. Alan’s Factory Outlet metal garages are custom-built in three different roof styles. 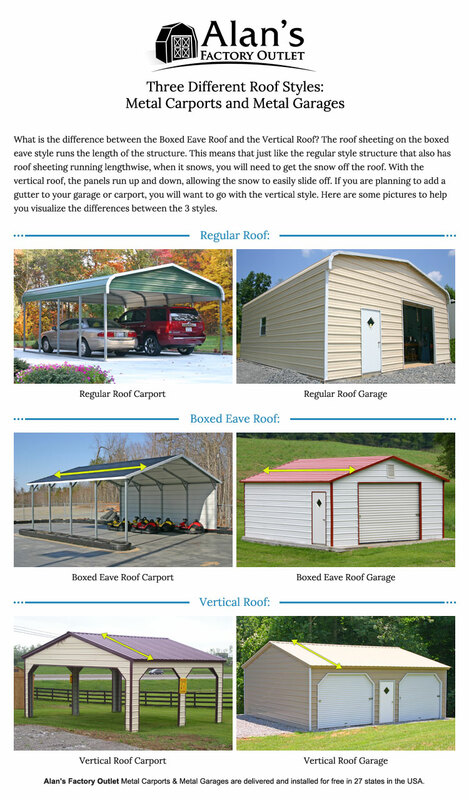 Here is a picture to explain the difference between the three different styles of steel garages. We have several standard steel garage buildings that can be customized to fulfill your unique needs. This allows you to order a steel garage that fits with the other structures on your property. Our metal garage buildings are made with 29-gauge metal sheeting and 14-gauge tubing. You can upgrade your order with 12-gauge tubing for additional sturdiness. Mobile home anchors are a good option if you don’t plan to place your garage on a concrete pad, as they can help to keep your garage more stable in high winds. If you’re not looking for a fully enclosed portable metal garage, then a metal carport may be the way to go. Metal carports may be left open or partially enclosed, and they are usually very basic in structure, so they’re usually less expensive than metal garages. Triple carports, metal barn lean-to buildings, and 40-foot steel garages are also available options. In Virginia and West Virginia, you also have the option of wood and vinyl garage buildings for sale. These prefab, Amish-built garages are delivered fully assembled and are available as two-car garages as well as two-story structures. These wooden buildings are excellent options for those who want a more traditional look for their garage structure. Does the Price for a Metal Garage Include Delivery and Setup? Yes. Our steel garage prices include delivery and installation on your level land in Alabama, Arkansas, Colorado, the District of Columbia, Florida, Georgia, Illinois, Indiana, Kansas, Kentucky, Louisiana, Maryland, Mississippi, Missouri, New Jersey, New Mexico, New York, North Carolina, Ohio, Oklahoma, Pennsylvania, South Carolina, Tennessee, Texas, Virginia, and West Virginia. We deliver and set up your sturdy metal garage so you can start enjoying it right away! What if I Want to Pick Up My Steel Garage or Carport and Handle the Installation Myself? We do not allow you to pick up steel garages from our warehouse. However, we do offer the option of having steel garage buildings dropped off at your home so you can assemble them. We prefer to deliver and set up our garage structures, but if you’d like to assemble yours yourself, you can. Although you will save 5% on the purchase price when you assemble your own metal garage, installing the garage yourself does void our one-year workmanship warranty. How Long After I Order a Steel Garage Will it Be Delivered? Time periods associated with delivery and installation vary depending on the state you live in. The delivery time for carports and metal garages is approximately seven to 30 days 50 percent of the time for the southern states, but northern states may have longer delivery times due to a higher probability of inclement weather. The estimated delivery time frames are not guaranteed, but approximately 90% of the time, delivery occurs within 60 days of us receiving the order at the factory. Please keep in mind that harsh winter weather conditions can make it difficult to complete an installation, so if you live in an area that experiences a lot of snow and ice, there is an increased chance that the wait time could exceed 90 days. If you wait more than 90 days for the delivery of your carport or metal garage, we will offer you a 10% discount off the balance due once the structure is installed. We can also provide a full refund of your deposit if you wish to cancel the order. However, for orders placed between Oct. 1 and spring in the District of Columbia, Indiana, Maryland, New Jersey, New York, Ohio, and Pennsylvania, this guarantee does not apply, as installations and deliveries in these locations will most likely be delayed until spring due to the frequency of winter storms. On the Day of Delivery, How Long Will it Take for My Metal Garage to Be Installed? Most smaller-size steel garage buildings are installed in about half a day. This includes the metal carports in our inventory as well. The larger buildings should be installed in one day. What Is the Difference Between the Regular, Boxed-Eave, and Vertical-Roof Steel Garages? Look at the top of a regular-roof garage and you’ll see a barn-shaped roof with rounded sides. It is the most economical type of metal garage. The leg height on regular garage packages is 8 feet, but at the top of the bend on the leg, you have an additional foot, giving you 9-foot legs with a 9-by-8 garage door. The boxed-eave and vertical-roof metal garage packages come standard with 9-foot legs fully enclosed with a 9-by-8 garage door. The boxed-eave style has an A-frame gable roof with a 6-inch overhang on both sides. The vertical style is also built with an A-frame roof and has a 6-inch overhang on both sides. All of the steel structures have a 6-inch overhang on the front and back ends. There is one main difference between the vertical- and the boxed-eave-style roofs. On the vertical-style, the roof sheeting runs up and down, allowing snow to slide off the side of the garage structure. On the boxed-eave as well as the regular roof style, the metal sheeting runs lengthwise. Also, the bracing on the vertical sheeting is attached under the roof, which brings an extra element of strength to a vertical-roof garage. Can a Metal Garage Be Made Taller? Yes, you can make our steel garages taller in 1-foot increments for up-to-16-foot legs. Do the Steel Garages Come in Wider and Longer Sizes? Yes, we have a wide variety of sizes available for both our steel and metal garages. They can be 12 feet, 18 feet, 20 feet, 22 feet, or 24 feet wide. The triple-steel garages are built in 26-foot, 28-foot, and 30-foot widths. We also have 40-foot-wide models, available in lengths of 32 feet, 34 feet, 36 feet, 38 feet, and 40 feet. The lean-to model comes in 36 feet, 42 feet, 44 feet, 46 feet, and 48 feet. It has 12 feet on both sides of the building. The lengths start at 21 feet and get longer in 5-foot increments: 26 feet, 31 feet, 36 feet, 41 feet, 46 feet, 51 feet, 56 feet, 61 feet, 66 feet, 71 feet, 76 feet, 81 feet, 86 feet, 91 feet, 96 feet, and 101 feet. To make them longer than 41 feet, we attach two of our steel garages end to end; they can be built longer than 101 feet. We recommend the vertical roof for any garage built 41 feet or longer. Can Metal Garages Be Made in a Custom Width or Length? Yes, we can make metal garages in a custom size, but we’ll charge you for the larger standard size when we do so. For example, let’s say you need a 17-foot-wide garage and the standard widths are either 12 feet or 18 feet. In this case, we’d charge you for the 18-foot model. This rule applies to length as well: If you need the length to be 24 feet and the 26-foot model is too long, we can make the base 24 feet long, but we’ll charge you for the 26-foot model. When figuring out the size you need, remember that when we say 26 feet long, that figure includes a 6-inch overhang on the front and back ends, so the exact base is 25 feet long. All of the widths on the metal garage are the exact base rail dimensions. The length listed includes a 6-inch overhang on the front and back ends. If you order a 24-by-26 size, you want your concrete slab to be exactly 24 feet wide by 25 feet long. What Is the Metal Garage Warranty? We offer a one-year workmanship warranty on our metal garages. A 20-year rust-through warranty is included with steel garages with optional thicker 12-gauge tubing. How Many Different Colors Are There to Choose From? You’ll get your choice of roof and trim colors from 16 color options. Orders can be placed online or over the phone by calling 1-888-537-2296. What Are the Payment Options for Metal Garages? We accept personal checks, Visa, Discover, and MasterCard. How Much Is the Deposit When Ordering a Steel Garage? The deposit is 12 percent to 17 percent depending on the price. The remaining balance is due after the garage is installed. What Kind of Braces Come With a Steel Garage? Two-foot-long braces are standard on all of the center trusses and the four corners. Braces are standard on 8-foot legs and taller steel garages. We anchor metal garages for free to the ground or asphalt with 32-inch-long rebar. We can anchor garages to a concrete slab with wedge anchors. Mobile home anchors are an optional upgrade if the garage is going to be placed on the ground. What Is a Certified Metal Garage? The certified package is available if you live in an area where you must present blueprint drawings of your steel garage to the local building department. These drawings show that the garage is rated for up to 140-mph winds and a 30-psf snow load. The certified package is available at an additional cost depending on the size. Certified metal garages are built fully braced and include mobile home anchors if they are going to be anchored to the ground. Driving down the highway, you’ll see a huge variety of logos on the backs of cars, but chances are good that they were made by one of these 15 auto companies, who own and build a vast majority of models on the roads these days. We’ve painted a picture of this worldwide automotive family tree, along with each major conglomerate’s yearly revenue. Find out who owns Mercedes-Benz, Volkswagen, Nissan, Volvo, Maserati, and all of your other favorite car companies. This map of car corporations might surprise you! There are a number of metals which have been discovered. They generally have similar properties such as being shiny, able to conduct electricity and remain solid at around room temperature. Nonmetals are usually the opposite of metals in their properties. They are not shiny, are not good at conducting electricity and at room temperature may remain a solid or turn into liquid or a gas. Some examples of what are considered metals are Aluminum, Potassium, Gold, Silver, Copper, Sodium and Mercury. Elements that would be considered non-metals in the periodic table include Nitrogen, Oxygen and Hydrogen. There are also a group of elements that have some properties of both metals and non-metals. And tend to fall in the category between the two groups. They are called metalloids and elements in this group include Silicon, Boron and Carbon.